Canada’s economy is proving increasingly robust in the second quarter, with inflation and retail sales coming in ahead of economists’ expectations. The consumer price index rose at an annual pace of 2.5 per cent in June, the fastest year-over-year acceleration since 2012, Statistics Canada said Friday from Ottawa. Economists in a Bloomberg survey anticipated a 2.3 per cent increase. In a separate report, the agency said the nation’s retailers posted a 2 per cent gain in sales in May, the biggest monthly advance since October, and double the median forecast from economists. The reports, a reverse of last month’s weather-related disappointment in sales and inflation data, will bolster expectations for continued interest rate increases this year from the Bank of Canada. The retail sales report in particular, which indicates consumer spending is ticking along, will be taken as a positive signal for the underlying strength of the country’s economy. Sales excluding car dealers were up 1.4 per cent, versus a 0.5 per cent forecast. The Canadian dollar jumped 1.1 per cent to $1.3132 against its U.S. counterpart at 9:07 a.m. Toronto time. Yields on two year government bonds climbed 4 basis points to 1.97 per cent. Investors are now pricing in about a 60 per cent chance of a quarter-point rate increase at the central bank’s October meeting, up from 50 per cent before the data release. “Traders are going to increasingly price in a third Bank of Canada hike this year,” Mendes said. “That’s still contingent on the evolution of data moving forward. We knew the second quarter was going to look pretty healthy. The question is, how much does it tail off in the second half of the year,” he said, citing questions over business investment, trade policy and the impact of rising interest rates in the economy. 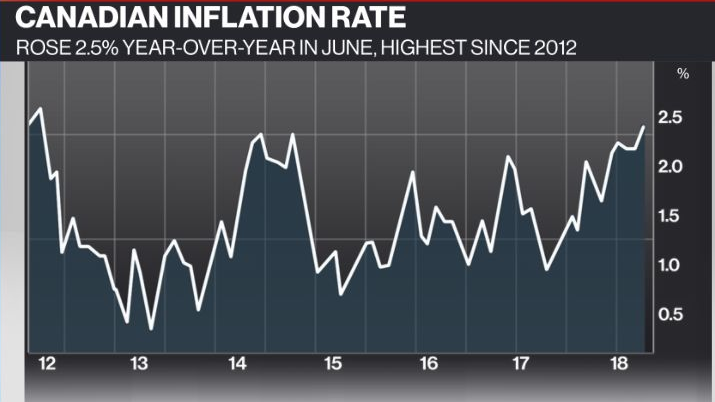 The inflation numbers are less of a surprise, given the Bank of Canada had indicated it expects CPI to spike before falling back later this year. The annual increase reflects higher gasoline prices and food purchased from restaurants, Statistics Canada said. On the month, consumer prices rose 0.1 per cent in June, versus an expectation for a flat reading. Core measures of inflation -- seen by officials as a better gauge of underlying trends -- ticked up slightly to an average of 1.97 per cent, from 1.93 per cent in May. The retail sales numbers largely reflected an increase in receipts at vehicle dealerships and gas stations, but even excluding autos the numbers came in well ahead of what economists were expecting. The strength was volume related, with sales up 2 per cent once price changes were factored out.